Looks like will hold strength is Bendigo is 36c very humid as bit cooler at west side of trough and hot East side of trough. 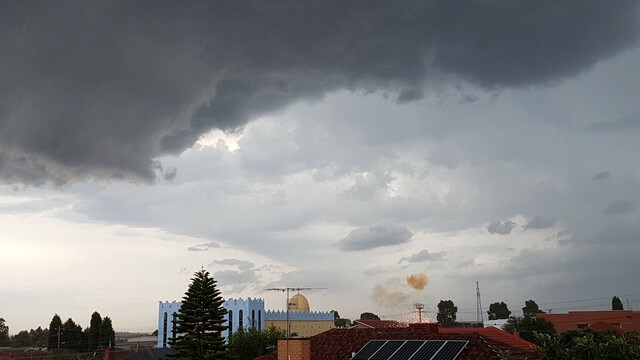 The Bureau of Meteorology has issued a Severe Thunderstorm Warning for people in parts of Port Phillip waters and Geelong and Bellarine Peninsula Local Warning Areas. 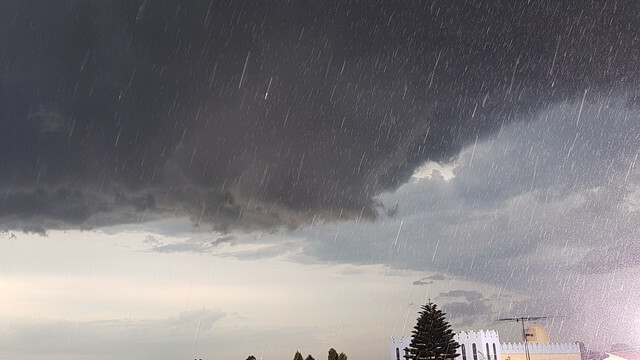 The Bureau of Meteorology warns that, at 5:05 pm, severe thunderstorms were detected on the weather radar near the area southeast of Rokewood, the area west of Meredith and the area east of Rokewood. These thunderstorms are moving towards the southeast. They are forecast to affect Anakie and the area south of the Brisbane Ranges by 6:05 pm. 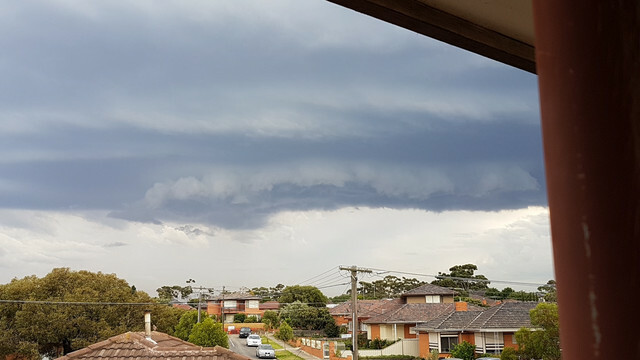 Be aware of potential hazards caused by the severe thunderstorm, including floodwater, debris, damaged building, trees down, fallen power lines]. Shes really getting ready to roll now . Seeing some nice intensification on the storms forming over the city viewing from the East to West. Ripper of a cell. Lots of close CG lightning and hence very loud thunder, one hit the power pole over the next street as I was watching and filming, sadly the bolt was just out of the frame, however did get the puff of smoke and sparks from the transformer in the footage. 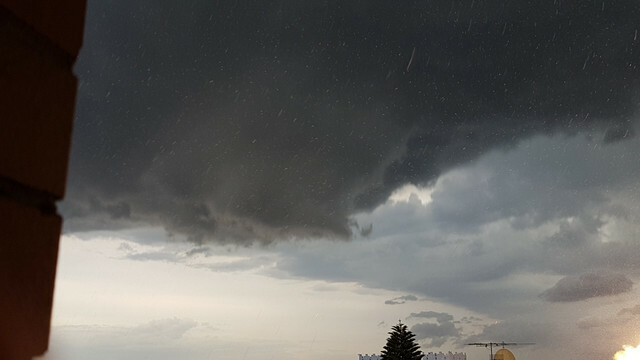 There was some hail with that cell, we got more lightning than rain however as we only got clipped by the northern edge as it moved towards the south east. That cell just completely fell apart . Dropped its guts on the inner North. Can feel cold outflow ahead of it now and its lost its structure completely from front on. Ohhh man you can even see the glow and the sparks!!!! Was trick just dry dust NE/N shifted SW with no rain then sudden started heavy rain 5min later. A nice ~17mm by our aws (still to check my gauge) - fairly steady and not too torrential. A couple of really close C G in town that made our house shake and boy were they loud! Power flicked out on the second strike. As always seems to be the case, you look away for a second and miss it as it hits, like RG just missing the strike on their camera! Excellent CA! And for you two Liberator. No rain here yesterday or today. But getting my exercise today doing freestlye, backstroke and breast stroke in the humidity. Currently 30C 60%RH very light SEly. 31C 55%RH here atm. Calm and overcast. Got 1mm from Tuesday night drizzle. Something might triggering somewhere Today as wind shear is shifting from NW to West from west Victoria and East Trough seem very slow. Is the Melbourne Metro still a chance? It looks like storms are forming East of Melbourne? Did the trough move East? The trough lying over Victoria is wide from West Horsham to East. To me it looks like all development is well East of Melbourne now making this a East VIC only event now. Hope to be proven wrong. Behind trough edge to west is weak and humid did not do anything so wait for South breeze push out humid.